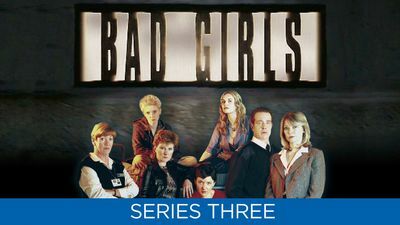 Here's where to watch every episode of Bad Girls season 3. Mouseover or tap an episode to see where to stream it. Click or tap the play icon to stream it on the best available service. Uninvited Guests May 8, 2001 Shell and Denny celebrated their freedom with a drugs and vodka binge...and Sylvia and Bobby Hollamby received a terrible visit from the pair, hell-bent on revenge! G-Wing was in chaos due to the escape and Jim Fenner a very worried man - especially when Shaz was brought back to Larkhall and questioned. Crystal was horrified to find Shell and Denny on her doorstep but agreed to let them stay the night - Shell, as vindictive as ever, repaid the favour in a way that would have disastrous consequences for Crystal's future. Simon Stubberfield was sacked as prison governor. Denny and Shell, armed with false passports, wigs and stolen cash, made their way to the airport but where were they going, and had left Larkhall behind forever? Chapel of Love May 22, 2001 Crystal is on a hunger strike to protest about her drugs test results and, after a retest is proved right! - Josh then realises what Di did and prepares for a confronation! Jim was horrified to learn that Helen was the governing governor, replacing Simon Stubberfield! Helen officially appointed Dr Waugh as new prison doctor and seemed to get on really well with him. Josh and Crystal got 'married' in the prison chapel in a service conducted by Babs. Nikki received news that her appeal was being transferred to the high court, meaning she had a good chance of being successful. The Peckham Boot Gang made a noisy arrival at Larkhall but what wing will they be on?(!) After a heavy confronation with Josh about the drugs tests, Di took out her violent anger once again on her mother, and the next day after being called ""sick"" by Josh, spiralled out of control - after being taken home by Jim, she was horrified when he discovered her badly bruised, neglected mother in her house! Battle Lines May 29, 2001 The Peckham boot gang arrives on G-Wing, causing chaos! Nigerian prisoner, Femi, can't speak a word of english and a peaceful protest about her treatment, led by Nikki, goes horrible wrong after the Boot Gang turns it into a full-scale riot! Charlotte Myddleton is shipped out to an open-prison. Al begins bullying Shaz but gets more than she bargains for from Yvonne - will Al and the rest of the Boot Gang ""waste her""?! During the riot, a new prisoner, Caroline, catches Nikki's eye. Violence erupted further when the screws, in full riot uniform, attempted to put the inmates into their cells! Helen was furious with Nikki after Sylvia told her about her envolvment with the 'peaceful protest'! Tough Love Jun 5, 2001 The riot finally ended peacefully because Nikki locked the Peckham boot gang in their cells - sadly for her though, Helen told Nikki that their relationship was over because of the part she had played in the chaos. Nikki then took an interest in new prisoner Caroline. The Julies argued over their plans for the future now that Julie S had met Trevor again but to their horror, they were re-arrested outside the prison gates for past crimes they had committed while working for Virginia O'Kane as 'The 2 Trudies'. Helen seemed to be yet more friendly with Dr Waugh. Femi was moved to E-Wing with Fatima, an english-speaking Nigerian prisoner. Nikki was perplexed as to why Helen was telling her to ""be careful"" of Caroline but found out from Maxi that Caroline's crime wasn't fraud...she was in prison for sexually abusing children!! Fronting Up Jun 19, 2001 Jim began his 'after-hours job' collecting money from Virginia's brothels. Helen was determined to prove that Jim is unfit to work with female prisoners and was very happy when Yvonne told her about the job he was participating in for Virginia. After yet another arguement between Helen and Jim, Karen made it clear to Helen that she was on Jim's side. Di spread lies about Gina. Virginia, while alone in her cell, stood up to look in the mirror, proving that her disability was a lie. Shaz asked for a transfer to the lifers' unit to get away from Al, but Dr Waugh suggested an unorthodox way of boosting her self-esteem. Crystal received the date for her court appearance. Gina and Di came to blows over Mark, with tragic consequences. Helen and Dr Waugh went to the dog races together and later, at his flat, shared a kiss! Cat & Mouse Jun 26, 2001 Josh received a surprise package from Denny that could prove Crystal's innocence. Jim told Nikki that Helen is now seeing Dr Waugh - Something Helen didn't deny! Virginia's disability was publically outed as a scam by Al. Helen continued to lie in wait for Jim at Virginia's brothels - she finally found him and told him she wanted his resignation letter or she would tell Karen and area. Jim blackmails Di into helping him find evidence about Helen's relationship with Nikki and is overjoyed when he finds in Babs' diary about Nikki's escape. Defeated by this new evidence, Helen has no ammo against Jim and is blackmailed by him to resign. Crystal was found guilty because Karen gave her a bad character statement - this was because Sylvia's stolen clock (remember that?) was found and returned to Karen!